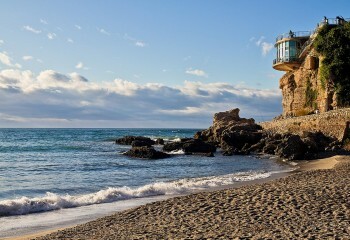 Nerja is situated in the East part of the Costa del Sol and enjoys, together with Torrox, an exceptional climate. In winter the temperature is a few degrees above, and in summer a few degrees below that found in many other villages in the Costa del Sol. This is because the Sierra de Almijara, the Sierra de Alhama and the Sierra de Tejeda protect this part of the Costa del Sol from the cold which comes from the North in winter and the inland heat in summer. While it might be 45°C ( 112º F)in Cordoba, Seville or Granada, it will only be between 30° C.(83º F), and 35°C (93º F) in Nerja. Nerja is a very popular spot for travellers seeking winter warmth as it generally has temperatures of around and above 20º C. (70º F). In the centre of the town and on the beach areas, where the apartments CASA CHARLOTTE, CARABEO 2000, LA MAQUINILLA and TERRAZAS 24 are located there is no pollen. This means in Spring time Nerja is an ideal place for escaping the inconvenience of hay fever should you be a hay fever sufferer. Together with its well filled cultural and folkloric calender, Nerja also offers beautiful hiking paths in natural parcs, all kind of water sports and many other outdoor activities such as tennis, mountain biking, para gliding etc. there are many pedestrian streets filled with all kind of shops and almost 300 restaurants ,cafés and tapas bars ; these will more than satisfy all your culinary wishes, including those of you who are vegetarian. Take the time to visit and discover Nerja ; you will find it one of the prettiest, most pleasant and safest places to be for your summer or winter holidays. If you arrive in Nerja travelling from Torrox on the N 340 (coastal) road you will see a sign saying ” PARAISO DE NERJA ” ( Paradise of Nerja). In reality this sums up what Nerja is truly about!